Does your new phone feel hot? I mean really, really hot, perhaps because it uses a mobile processor that's running much hotter than some of its contemporaries? Maybe it could use an infusion of conceptual tech from Fujitsu. The manufacturer and OEM supplier is currently showing off its "thin cooling device for compact electronics" (catchy! 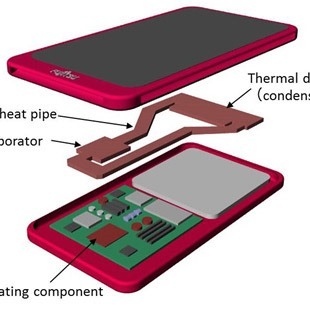 ), a liquid cooling solution designed for high-performance mobile chipsets. That's not astounding in and of itself; what is impressive is that they've made it only one millimeter thin.